Salmon is not only easy to prepare but also packed full of important nutrients. Large quantities of omega-3 fatty acids are perhaps is most beneficial quality. These healthy fats reduce inflammation, improve cholesterol and reduce blood clotting. They are so good for you, in fact, that dietary experts at the American Heart Association recommend eating fatty fish, such as salmon, at least 2 times per week. 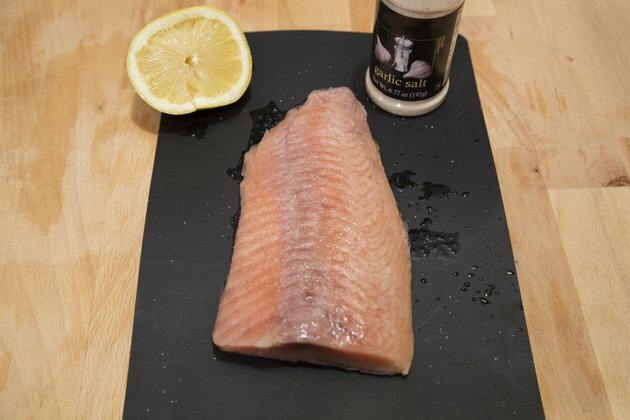 Skinless salmon requires little seasoning and cooks well with a number of methods. Preheat an oven to 450 degrees Fahrenheit. 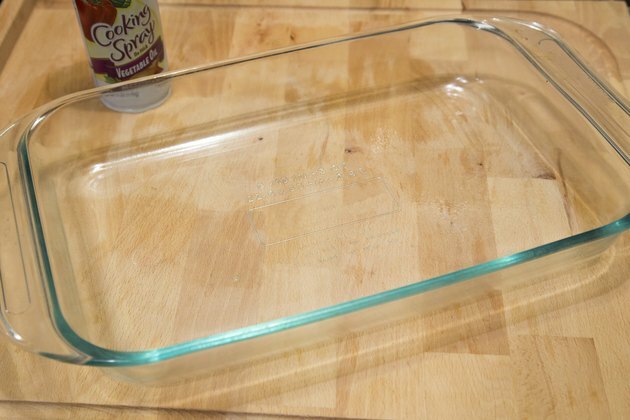 Coat a baking dish with nonstick cooking spray. Season the salmon. For a simple seasoning, sprinkle the fish with a dash each of salt and pepper. 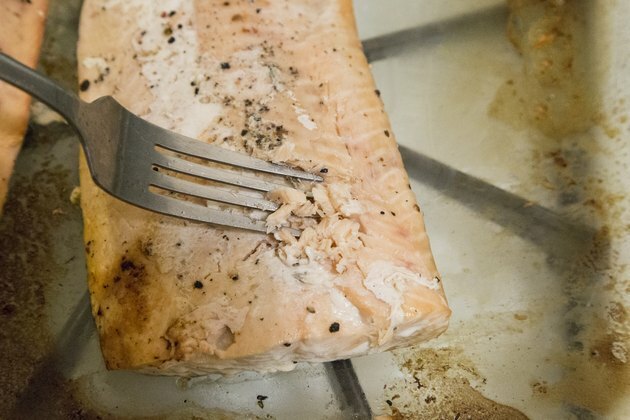 Other seasonings that pair nicely with salmon include dill weed, garlic, parsley and tarragon. Place the salmon in the baking dish. Transfer the dish to the oven and cook for approximately 15 minutes or until cooked through. 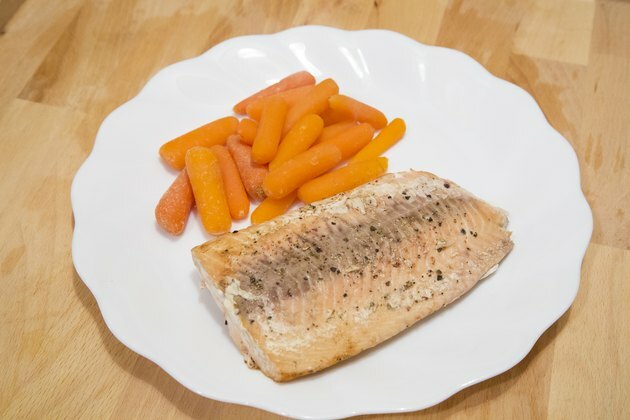 Salmon is done when the fish flakes easily with a fork. Heat 2 tablespoons of olive oil in a frying pan over medium-high heat. Season the salmon according to your taste preferences. Transfer the salmon to the frying pan. Cook the fish for approximately three minutes or until the bottom is just slightly browned and crispy. Use a spatula to gently flip the fish. Continue to cook for approximately three minutes or until the salmon is cooked through. Marinate the salmon. For an Asian flavor, mix together soy sauce, olive oil, Dijon mustard and minced garlic. 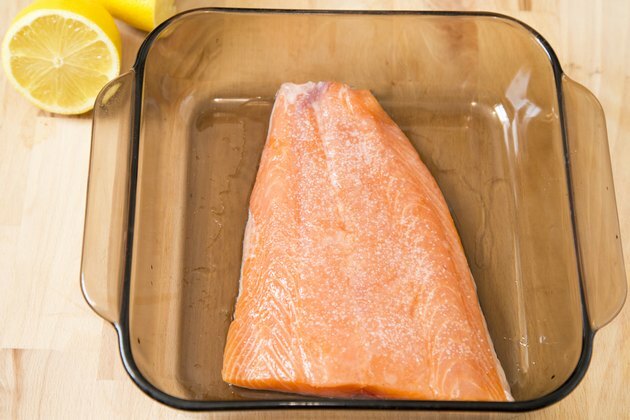 Other salmon marinades may include honey, horseradish, lemon juice, sherry vinegar and dry herbs. Soak the salmon in the marinade, refrigerated, for ten minutes. Transfer the salmon onto the grill. 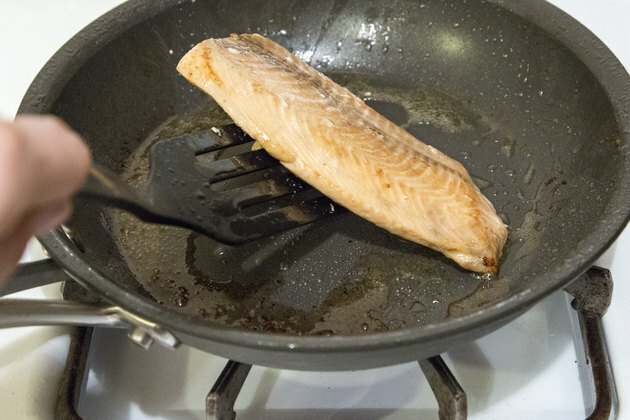 Cook the fish for approximately three minutes or until the bottom is slightly browned. 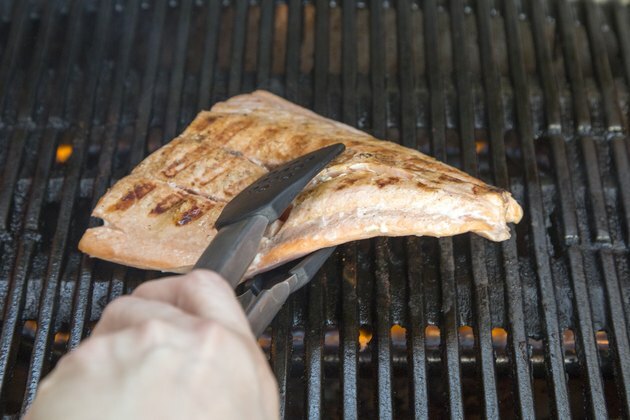 Use tongs to gently flip the fish. Cook for an additional two minutes or until it is cooked through. 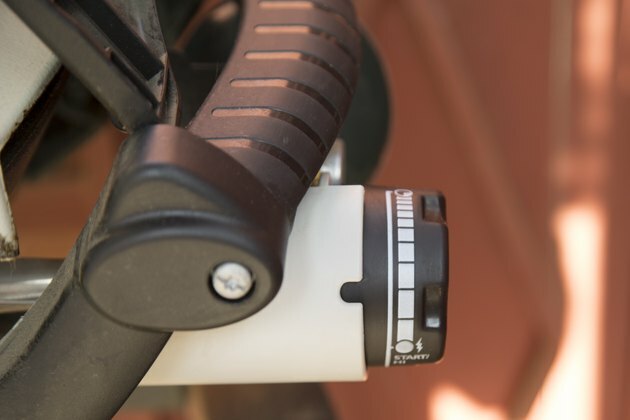 Use a meat thermometer to ensure the salmon is fully cooked. 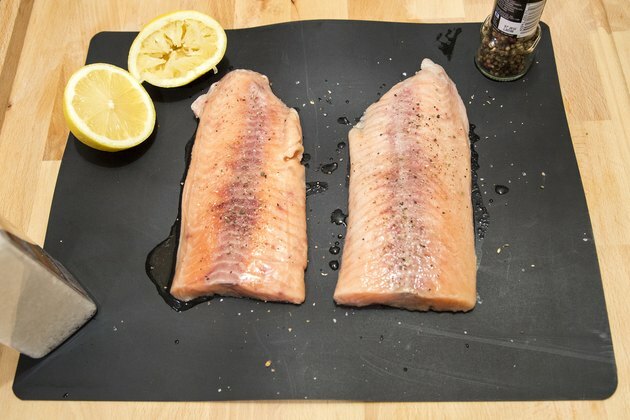 The U.S. Department of Agriculture guidelines for safe food handling recommend cooking fish to an internal temperature of 145 degrees Fahrenheit. 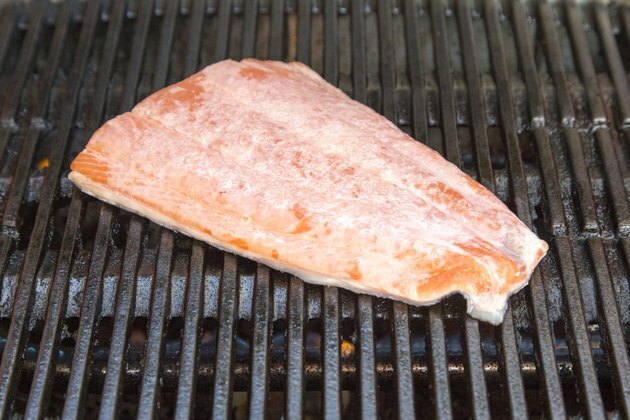 How Do I Grill Salmon on a George Foreman Grill?